What are the causes of other types of scoliosis? What tests to health care professionals use to diagnose scoliosis? Are there home remedies for scoliosis? Is there a cure for scoliosis? Is it possible to prevent scoliosis? Where can people get more information on scoliosis? There are several types of scoliosis based on the cause and age when the curve develops; the majority of patients have no known cause. Diagnosis is done by the physical exam and by imaging techniques such as X-rays, CT scans, or MRI. Orthopedic surgeons or neurosurgeons are often consulted if surgery is needed. The prognosis for an individual with scoliosis ranges from mainly good to fair, depending on how early the problem is diagnosed and treated. There is no cure for scoliosis, but the symptoms can be reduced. Scoliosis is a disorder that causes an abnormal curve of the spine, or backbone. The spine has normal curves when looking from the side, but it should appear straight when looking from the front. Kyphosis is a curve in the spine seen from the side in which the spine is bent forward. There is a normal kyphosis in the middle (thoracic) spine. Lordosis is a curve seen from the side in which the spine is bent backward. There is a normal lordosis in the upper (cervical) spine and the lower (lumbar) spine. People with scoliosis develop additional curves to either side of the body, and the bones of the spine twist on each other, forming a "C" or an "S" shape in the spine. Scoliosis is about two times more common in girls than boys. It can be seen at any age, but it is most common in those over about 10 years of age. Scoliosis is hereditary in that people with scoliosis are more likely to have children with scoliosis; however, there is no correlation between the severity of the curves from one generation to the next. 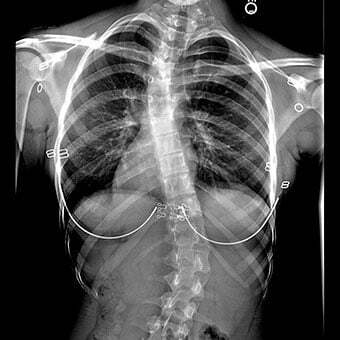 Source: "Amanda-Scoliosis" by University of Utah Hospital - Radiology Department - X-Ray Image. 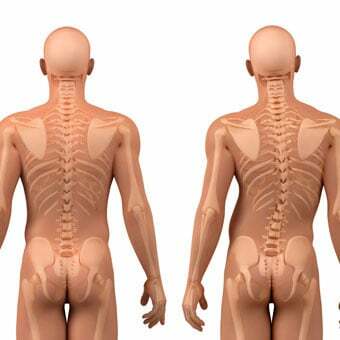 Scoliosis affects about 2% of females and 0.5% of males. In most cases, the cause of scoliosis is unknown (known as idiopathic). This type of scoliosis is described based on the age when scoliosis develops, as are other some other types of scoliosis. If the person is less than 3 years old, it is called infantile idiopathic scoliosis. Scoliosis that develops between 3-10 years of age is called juvenile idiopathic scoliosis. People who are over 10 years old (10-18 years old) have adolescent idiopathic scoliosis. More than 80% of people with scoliosis have idiopathic scoliosis, and the majority of those are adolescent girls; the most common location for scoliosis is in the thoracic spine. Neuromuscular: In this type of scoliosis, there is a problem when the bones of the spine are formed. Either the bones of the spine fail to form completely or they fail to separate from each other during fetal development. This type of congenital scoliosis develops in people with other disorders, including birth defects, muscular dystrophy, cerebral palsy, or Marfan syndrome (an inherited connective tissue disease). People with these conditions often develop a long C-shaped curve and have weak muscles that are unable to hold them up straight. If the curve is present at birth, it is called congenital. This type of scoliosis is often much more severe and needs more aggressive treatment than other forms of scoliosis. Age is a risk factor as the symptoms often begin between 9-15 years of age. Being a female increases the risk of scoliosis, and females have a higher risk of worsening spine curvature than males. Although many individuals who develop the problem do not have family members with scoliosis, a family history of scoliosis increases the risk of the disease. The most common symptom of scoliosis is an abnormal curve of the spine. Often this is a mild change and may be first noticed by a friend or family member or physician doing routine screening of children for school or sports. The change in the curve of the spine typically occurs very slowly so it is easy to miss until it becomes a more severe physical deformity. It can also be found on a routine school screening examination for scoliosis. Those affected may notice that their clothes do not fit as they did previously, they may notice an uneven waist, or that pant legs are longer on one side than the other. Scoliosis may cause the head to appear off center, leaning to one side or notice one hip or shoulder to be higher than the opposite side. Someone may have a more obvious curve on one side of the rib cage on their back from twisting of the vertebrae and ribs. If the scoliosis is more severe, it can make it more difficult for the heart and lungs to work properly. This can cause shortness of breath and chest pain. In most cases, scoliosis is not painful, but there are certain types of scoliosis than can cause back pain, rib pain, neck pain, muscle spasms, and abdominal pain. Additionally, there are other causes of these nonspecific pains, which a doctor will want to look for as well to rule out other diseases. If someone thinks he or she has scoliosis, see a doctor for an examination. The doctor will ask questions, including if there is any family history of scoliosis, or if there has been any pain, weakness, or other medical problems. The physical examination involves looking at the curve of the spine from the sides, front, and back. The person will be asked to undress from the waist up to better see any abnormal curves, physical deformities, or uneven waist. The person will then bend over trying to touch their toes. This position can make the curve more obvious. The doctor will also look at the symmetry of the body to see if the hips and shoulders are at the same height, leaning to one side, or if there is sideways curvature. Any skin changes will also be identified that can suggest scoliosis due to a birth defect. A doctor may check your range of motion, muscle strength, and reflexes. The more growth that a person has remaining increases the chances of scoliosis getting worse. As a result, the doctor may measure the person's height and weight for comparison with future visits. Other clues to the amount of growth remaining are signs of puberty such as the presence of breasts or pubic hair and whether menstrual periods have begun in girls. If the doctor believes a patient has scoliosis, the patient could either be asked to return for an additional examination in several months to see if there is any change or the doctor may obtain X-rays of the back. If X-rays are obtained, the doctor can make measurements from them to determine how large of a curve is present. This can help decide what treatment, if any, is necessary. Measurements from future visits can be compared to see if the curve is getting worse. It is important that the doctor knows how much further growth the patient has left. Additional X-rays of the hand, wrist, or pelvis can help determine how much more the patient will grow. If a doctor finds any changes in the function of the nerves, he or she may order other imaging tests of your spine, including an MRI or CT scan to look more closely at the bones and nerves of the spine. Usually, a person's primary care or pediatric physician notices the problem and consults an orthopedic surgeon or neurosurgeon who specializes in spine surgery. In addition, a rehabilitation specialist and/or a physical therapist may be consulted. Some patients may need a neurologist or an occupational therapist as part of the treatment team. Treatment of scoliosis is based on the severity of the curve and the chances of the curve getting worse. Certain types of scoliosis have a greater chance of getting worse, so the type of scoliosis also helps to determine the proper treatment. There are three main categories of treatment: observation, bracing, and surgery. Consequently, there are treatments available that do not involve surgery, but in some individuals, surgery may be their best option. Functional scoliosis is caused by an abnormality elsewhere in the body. This type of scoliosis is treated by treating that abnormality, such as a difference in leg length. A small wedge can be placed in the shoe to help even out the leg length and prevent the spine from curving. There is no direct treatment of the spine because the spine is normal in these people. Neuromuscular scoliosis is caused by an abnormal development of the bones of the spine. These types of scoliosis have the greatest chance for getting worse. Observation and bracing do not normally work well for these people. The majority of these people will eventually need surgery to stop the curve from getting worse. In many cases, infantile idiopathic scoliosis will improve without any treatment. X-rays can be obtained and measurements compared on future visits to determine if the curve is getting worse. Bracing is not normally effective in these people. Juvenile idiopathic scoliosis has the highest risk for getting worse of all of the idiopathic types of scoliosis. Bracing can be tried early if the curve is not very severe. The goal is to prevent the curve from getting worse until the person stops growing. Since the curve starts early in these people, and they have a lot of time left to grow, there is a higher chance for needing more aggressive treatment or surgery. As explained above, scoliosis is not typically associated with back pain. However, in some patients with back pain, the symptoms can be lessened with physical therapy, massage, stretches, and exercises, including yoga (but refraining from twisting pressures on the spine). These activities can help to strengthen the muscles of the back. Medical treatment is mainly limited to pain relievers such as nonsteroidal anti-inflammatory medications (NSAIDs) and anti-inflammatory injections. These treatments are not, however, a cure for scoliosis and will not be able to correct the abnormal curve. There are several different types of braces available for scoliosis. Some need to be worn nearly 24 hours a day and are removed only for showering. Others can be worn only at night. The ability of a brace to work depends on the person following the instructions from the doctor and wearing the brace as directed. Braces are not designed to correct the curve. They are used to help slow or stop the curve from getting worse with good back brace management treatment. Intermittent or chronic discomfort may be a side effect of any treatments used to slow or correct the spinal curvature. If the curve stays below 40 degrees until the person is finished growing, it is not likely to get worse later in life. However, if the curve is greater than 40 degrees, it is likely to continue to get worse by 1-2 degrees each year for the rest of the person's life, a long-term effect of the disease. If this is not prevented, the person could eventually be at risk for heart or lung problems. The goals of surgery for scoliosis are as follows: correcting and stabilizing the curve, reducing pain, and restoring a more normal curve and appearance to the spinal column. Surgery involves correcting the curve back to as close to normal as possible and performing a spinal fusion to hold it in place. This is done with a combination of screws, hooks, and rods that are attached to the bones of the spine to hold them in place. The surgeon places bone graft around the bones to be fused (spinal fusion) to get them to grow together and become solid. This prevents any further curvature in that portion of the spine. 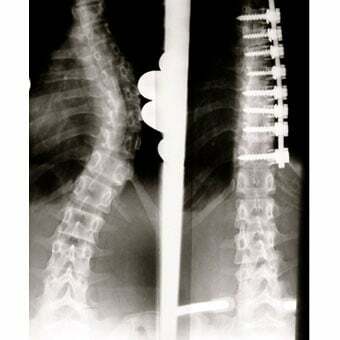 In most cases, the screws and rods will remain in the spine and not need to be removed. There are many different ways for a surgeon to perform the fusion surgery. It may be all performed from a single incision on the back of the spine or combined with another incision along your front or side. This decision is based on the location and severity of the curve. Surgery recovery and scar formation varies some from person to person. A doctor will use medications to control the patient's pain initially after surgery. A patient will likely be up out of bed to a chair the first day after surgery and will work with a physical therapist who will assist him or her in walking after the surgery. As the patient continues to recover, it is important to improve muscle strength. The physical therapist can help the patient with exercises for the muscles that will also help with the pain. Typically, a young person will miss about six weeks of school and may take about six months to return to their normal activities, although recovery time varies between individuals. As with any surgery, there are risks of surgery for scoliosis. The amount of risk depends partially on the patient's age, the degree of curve, the cause of the curve, and the amount of correction attempted. In most cases, the surgeon will use a technique called neuromonitoring during surgery. This allows the surgeon to monitor the function of the spinal cord and nerves during surgery. If they are being placed at increased risk of damage, the surgeon is alerted and can adjust the procedure to reduce those risks. There is a small risk of infection with any surgery. This risk is decreased with the use of antibiotics, but it can still occur in some cases. Other potential risks include injury to nerves or blood vessels, bleeding, continued curve progression after surgery, broken rods or screws, and the need for further surgery. Each of these is rare. If a tumor such as osteoid osteoma is the cause of the scoliosis, surgery to remove the tumor is generally able to correct the curve. People with degenerative scoliosis will often have more complaints of back pain and leg pain. This is related to the arthritis in the back and possible compression of the nerve roots that lead to the legs. Nonoperative treatment including physical therapy, exercises, and gentle chiropractic can help relieve these symptoms in some cases. People who fail to improve with these treatments may benefit from surgery. X-rays and possible MRIs will be obtained to plan for surgery. The surgery could include only a decompression or removal of bone spurs that are compressing the nerves. In some cases, a fusion will be necessary to stabilize the spine and possibly correct the abnormal curve. The cost of scoliosis surgery can be high; according to the Spinal Cord Society of surgeons, an average cost per operation (rod implants to straighten the spine) is $150,000 and may be higher or lower depending on the individual procedure. There are many home remedies that have been described for scoliosis; some involve herbal treatments, diet therapy, massage, physical therapy, stretches, certain exercises, and nutritional supplements like L-selenomethionine. A mattress that is composed of latex, memory foam, or cool gel (latex mattress infused with gel retains less heat than latex alone, also termed gel memory foam) and is adjustable (height of head and foot of bed can be adjusted) is recommended by some clinicians and patients. Patients are advised to discuss these treatments, especially exercises, with their doctor before starting any home remedies. Medical treatments are mainly over-the-counter pain medications when needed. Home remedies and medical treatments may reduce discomfort but do not provide a cure for scoliosis. School screening programs have helped to identify many cases of scoliosis early. This allows people to be treated with either observation or bracing and avoid the need for surgery in many cases. Most people with scoliosis can live full, productive, and normal lives with a relatively normal life expectancy. People with scoliosis are able to become pregnant and have children with no increased risk for complications. They may be at increased risk for additional low back pain during pregnancy. In general, as the degree of spine curvature increases, the prognosis worsens. Newer advances in surgery have allowed for less invasive surgical methods that have less pain and shorter recovery periods. Surgery recovery time depends on the specific procedure that is performed; some may require an extended hospital stay with an in-patient stay at a rehabilitation facility (several weeks) while others may recover quickly and not require a rehabilitation facility. These techniques are still being developed, but the initial results are very promising. Occasionally, untreated scoliosis can lead to deformity of the spine that is severe, painful, and result in the individual being unable to work or walk normally. Scoliosis may very rarely compromise breathing and cause death. Complications of pain and infections may rarely occur with treatments but may occur with surgery. Occasionally, patients are too optimistic about their treatments so patients are advised to discuss their expectations and follow up with their doctor to better understand the long-term prognosis and effects of their treatment. The life expectancy has been reported to be reduced possibly by about 14 years in some individuals, especially those with more severe Cobb angle that is untreated but not all specialists agree with this controversial conclusion. Other clinicians either choose to avoid the controversy and say nothing while others suggest most people will have a near normal life span. Each individual with scoliosis should ask their treating physician about their life expectancy and potential for quality of life in the future with or without various treatment options. At this time, there is no cure for scoliosis. There are good treatment options as discussed above. Researchers are trying to find the causes of the different types of idiopathic scoliosis. This will hopefully lead to better treatments or a cure. Because the cause of idiopathic scoliosis is not known, there is no known way to prevent the problem. However, doctors speculate that doing certain exercises (Pilates, yoga, for example, with moves that torque or twist the spine) may make scoliosis worse. Gymnastics activities (like doing back bends), carrying weight on one side of the body (like a backpack on one shoulder), and using a trampoline are examples of ways to potentially make scoliosis worse. This association publishes a quarterly newsletter and pamphlets. The association also provides information about local chapters and support groups. To obtain a copy of the American Physical Therapy Association's brochure about scoliosis, you may send a self-addressed, stamped envelope to their address above. Fu, K.M., J.S. Smith, D.W. Polly, C.P. Ames, et al; Scoliosis Research Society Morbidity and Mortality Committee. "Morbidity and Mortality Associated With Spinal Surgery in Children: A Review of the Scoliosis Research Society Morbidity and Mortality Database." J Neurosurg Pediatr 7.1 Jan. 2011: 37-41. Mehlman, Charles T. "Idiopathic Scoliosis." Medscape.com. Jan. 29, 2016. <http://emedicine.medscape.com/article/1265794-overview>. Negrini, S., S. Minozzi, J. Bettany-Saltikov, F. Zaina F, et al. "Braces for Idiopathic Scoliosis in Adolescents." Spine (Phila Pa 1976) 35.13 June 1, 2010: 1285-1293. Phan, P., N. Mezghani, C.E. Aubin, J.A. De Guise, and H. Labelle. "Computer Algorithms and Applications Used to Assist the Evaluation and Treatment of Adolescent Idiopathic Scoliosis: A Review of Published Articles 2000-2009." Eur Spine J. Jan 30, 2011. How was your scoliosis detected and diagnosed? What was your scoliosis treatment? Describe the signs and symptoms associated with scoliosis in you or your child. What do you suspect the cause of scoliosis was in you or your child? Please describe your experience with scoliosis.